As the trends go through wine, it is hard to keep sight of what we think a cab is. Just like Chardonnays, which at some point suffered from the buttery-oak debasement, cab producers are running from traditional big bottoms on their wines. It’s like new Coke vs old Coke, at what point do you lose the value of the flavor that made your fortune? Personally, I love all the variations of the grape Cabernet Sauvignon, and the way they are put together, but am I a fair person to ask? I’m not your average consumer. I’m also not in the rarefied air of the over-tasted either. In my mind, I’m juuuust about right. Of course I am. So, I have to say that when I was at Ian Blackburn’s 5th Annual Stars of Cab 2013, the barrel gimmick caught me. I’m no more impervious to cheap carnival tricks then the next rube. Taste directly from the barrel! Sign me up. 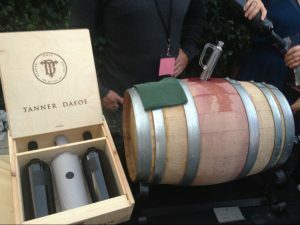 Tanner DaFoe was giving tastes out of a miniature barrel of their 2011 Cabernet Sauvignon. Then, as the wine was being siphoned for me, I felt a bit ridiculous, like I had bought the cereal with the best prize sunken deep inside, but not necessarily the best taste. Glad to say — the Tanner DaFoe 2011 cab jumped past the clever way it lured me, and had that coveted French woosh, along with the American big-bottoms-my-gurls-gottem cab taste that I adore. This speaks to the heart of moving the barriers of cabs past what we think they are. You don’t want “This cab is so not cab” to the point of becoming “Yeah, it’s not really tasting like a cab anymore. So, I’ll just go get a merlot which does this flavor better anyway.” Speaking of which —St. Supéry’s Rutherford Merlot was stellar. I know it’s very contrapositive to rave about the one Merlot you found at the cab tasting, but it was good. Continuing with the contrarian theme, even Rex Pickett the Merlot Industry Gremlin, now has Sunstone winery making his own brand — “The Apostate. Back on cab track — Tanner Dafoe’s 2009 also impressed, well-rounded, a perfect circle of a beverage. The Whole Foods wine buyer was circling around this table, I hope she stocks the stores, thus giving me another reason to go in there besides stealing olives off the salad bar. Frank Family delivered it’s usual solid standard with it’s 2009 Rutherford Reserve Cabernet. Grgirghghghg Hills (okay, actually spelled Grgich) had a 2009 Cab from Yountville that thrilled. Hawk and Horse Vineyards logged in with their frenchy 2009 HHV/Block Three and I even found a Pinot Noir from Truchard that stood out. Granted, you always question your picks of non-cab wines at a cab event. Are you simply responding to a break in the particular grape you are being inundated with? Of course, I question any choice I make in life about anything — so to make everyone feel safer — all of my picks here were vetted by peers who actually have truly educated palates built on knowledge and experience.